The fishes and the coral live happily in the CO2 bubble plume | Watts Up With That? Willis Eschenbach’s post on lab work on coral response to elevated carbon dioxide levels, and The Reef Abides, leads to a large scale, natural experiment in Papua New Guinea. There are several places at the eastern end of that country where carbon dioxide is continuously bubbling up through healthy looking coral reef, with fish swimming around and all that that implies. What that implies is that ocean acidification is no threat at all. If the most delicate, fragile, iconic ecosystem of them all can handle flat-out saturation with carbon dioxide, what is there to worry about? That lack of a threat is a threat to a human institution though – the Australian Institute of Marine Science (AIMS) based in Townsville, north Queensland run by Professor Ove Hoegh-Guldberg. To quote Walter Starck (http://www.bairdmaritime.com/index.php?option=com_content&view=article&id=6171:png-coral-reefs-and-the-bubble-bath&catid=99:walter-starcks-blog&Itemid=123) – “A never ending litany of purported environmental threats to Australia’s Great Barrier Reef has maintained a generous flow of funding for several generations of researchers. The “reef salvation” industry now brings about US$91 million annually into the local economy in North Queensland. So AIMS mounted an expedition to Papua New Guinea to examine the large scale, natural experiment that was a threat to their livelihood. They reported in Nature (http://www.nature.com/nclimate/journal/v1/n3/pdf/nclimate1122.pdf?WT.ec_id=NCLIMATE-201106) that while the reefs they examined looked healthy, they didn’t like them. The threat has been averted for the moment, but maintaining funding requires constant vigilance. To lend credence to David Archibald’s post, here’s a story on Bob Halstead’s diving website. According to Wikipedia “The Shell Game is portrayed as a gambling game, but in reality, when a wager for money is made, it is a confidence trick used to perpetrate fraud”. The shell game has been of particular interest to me after reading a scientific letter “Volcanic carbon dioxide vents show ecosystem effects of ocean acidification” published in Nature a couple of years ago. Since then there has been a deluge of alarmist warnings on “Ocean Acidification” – including one in the Feb/March issue of Dive Pacific from an organization called the “International Union for the Conservation of Nature” – but no actual reefs destroyed by it, of course. The letter was illustrated by photographs of eroded shells and predictably concluded that this was due to ocean acidification, caused by too much atmospheric CO2 which Al Gore tells us is caused by bad humans burning fossil fuels to survive and prosper (as he did), instead of buying carbon credits from him and becoming poor. The reason for my scepticism was my own well-publicised underwater observations at Dobu Island in Milne Bay where CO2 vents bubble through a thriving coral reef. Just maybe, I thought, these people do not a have a clue what they are writing about. So when they approached me to see if they could dive Dobu I said of course, but that I was not interested in cherry picking data to conform to any conspiracy to promote Anthropogenic Global Warming. Interestingly I never heard back from them. Now we have the astonishing “Climategate” scandal revealing a huge scientific fraud producing the dodgy evidence used by the IPCC and environmental activists to predict Global Apocalypse, and a Copenhagen Treaty more designed to foster World Government than combat pollution. I originally wrote this before the Copenhagen conference so had no idea what a total fiasco and lie-fest it turned out to be. But I have real news!! “In a striking finding that raises new questions about carbon dioxide’s (CO2) impact on marine life, Woods Hole Oceanographic Institution (WHOI) scientists report that some shell-building creatures—such as crabs, shrimp and lobsters—unexpectedly build more shell when exposed to ocean acidification caused by elevated levels of atmospheric carbon dioxide (CO2). Because excess CO2 dissolves in the ocean—causing it to “acidify” —researchers have been concerned about the ability of certain organisms to maintain the strength of their shells. Carbon dioxide is known to trigger a process that reduces the abundance of carbonate ions in seawater—one of the primary materials that marine organisms use to build their calcium carbonate shells and skeletons. But in a study published in the Dec. 1 issue of Geology, a team led by former WHOI postdoctoral researcher Justin B. Ries found that seven of the 18 shelled species they observed actually built more shell when exposed to varying levels of increased acidification. This may be because the total amount of dissolved inorganic carbon available to them is actually increased when the ocean becomes more acidic, even though the concentration of carbonate ions is decreased. “It’s hard to predict the overall net effect on benthic marine ecosystems,” he says. “In the short term, I would guess that the net effect will be negative. In the long term, ecosystems could re-stabilize at a new steady state. Having studied Climategate it is not difficult to work out how this amazing and welcome press release actually got published instead of being censored or trivialised, as so many other inconvenient anti-AGW scientific papers and observations have been. The last line is the key (…we really need to bring down CO2 levels in the atmosphere.”). This inclusion was designed to appease the alarmist fanatics, and enable the paper – which is a staggering departure from the usual AGW propaganda – to be published. Brilliant. Look out! Woods Hole has found a way of beating the Shell Game. He has similar photos not only of Coral and CO2 bubbling up, but of sea grass patches. One of the numerous smaller bubble streams coming up through lush beds of Thalassia. On 14 February 2010 we visited two geothermal areas in the D’Entrecasteaux Islands, Milne Bay Province, PNG. One is located near the north end of Normanby Island about 30 m S.E. of the outer end of the wharf at the village of Esa’Ala. The other is a well known dive site known as the “Bubble Bath”. It is located about 20 m offshore near the mid-north coast of Dobu Island, an extinct volcano. At Esa’Ala the area of bubble venting is scattered along the inner edge of a fringing reef which is about 10 -15 m in width. 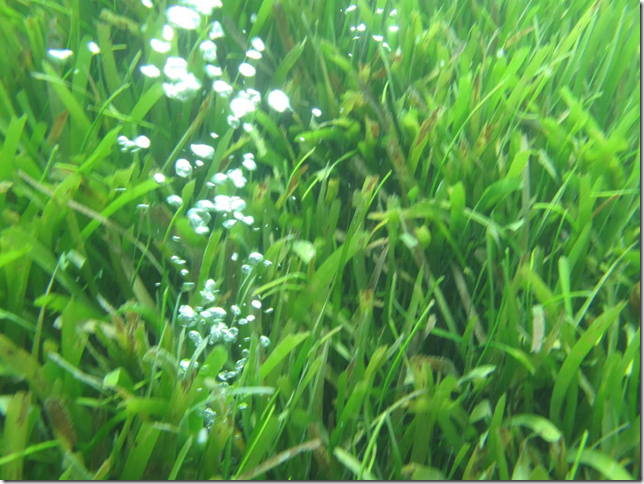 The outside edge slopes steeply into deep water and the inside edge is bordered by grass beds (Thalassia sp.) on silty bottom of mixed reef and volcanic sediments. The bubbling is near continuous small trickles at numerous points scattered amid both grass and coral areas in water depths of 3 – 5 m. The location is sheltered from prevailing wind and wave action. Both coral and plant growth were unusually luxuriant. In the grass beds small juvenile rabbitfish (Siganus sp.) are abundant feeding on the epiphytic algae growing on the grass blades. The pH of water samples was measured using a Pacific Aquatech PH-013 High Accuracy Portable pH Meter with a resolution of 0.01 pH. It was calibrated with buffered solutions at pH 6.864 and pH 4.003 immediately before measuring the samples. The Esa’Ala sample was taken immediately adjacent to a Porites coral and about 10 cm from a small bubble stream. The pH was 7.96. A sample from next to a Porites coral at the “Bubble Bath” measured 7.74. This was also about 10 cm from a somewgat larger bubble stream and about 12 m from the main gas vent. A sample next to the main vent measured 6.54. A sample from the open ocean just outside Egum Atoll about 100 Km N.E. of Dobu read 8.23 which is near typical for open ocean in this region. It seems that coral reefs are thriving at pH levels well below the most alarming projections for 2100. The biggest threat we face isn’t to Barrier Reef tourism. The whole modern economy is founded on cheap abundant energy. High energy liquid fuel is essential to all mobile heavy machinery. Trucks, tractors, trains, ships, planes and earth moving equipment cannot be run on sunbeams and summer breezes. The International Energy Agency along with virtually all oil industry analyst groups now recognise that future global oil supplies are likely to be increasingly tight and more expensive. Maybe I don’t understand the mechanism completely, but if the globe is warming, then CO2 solubility goes down in the warming oceans causing CO2 to off-gas from the oceans as seen in Mauna Loa, which in the end cause a reduction in acidity, not an increase. Or do I have that wrong? Just a word of caution on the chemistry of subsea volcanic gas vents. Volcanic eruptions usually contain sulfur and sulfur compounds like H2S, SO2 and SO3. They form acids in solution and the sulfuric acid formed by SO3 in water is a very strong mineral acid. It would not surprise me to see eroded shells or corals attributed to the effects of CO2 when the damage actually comes from these sulfur bearing acids. Unless the gasses are analyzed, we will not know their specific content. And I do know there are natural, relatively pure CO2 sources, but we just need to make sure. One needs a research paper comparing how long humans spend on the toilet at various bathroom temperatures. Wrap it up with a closing paragraph about the need to bring down atmospheric CO2 levels and submit it to Nature. You, too, can be a published researcher. There it is, in a nutshell: although the reef community is robust, it isn’t the reef community they see elsewhere, and therefore the reef communities throughout the world will die. They “change” for loss (intent, not words), take as an assumption that the models predict both accurately, and use both to affirm prior statements underpinning their jobs, livelihoods, careers, public- and self-image. Scientists. Wizards. Priests. Politicians. Ideologues. Scammers, promoters and fraudsters. How can we tell the difference between them any more? That about sums up the last three decades in climate science. Gee, I guess the sky isn’t falling. “Carbon dioxide is known to trigger a process that reduces the abundance of carbonate ions in seawater—” From WHOI? So sad! This is a patent lie! CO2 is part of an extended equilibrium from CO2 to carbonic acid to bicarbonate to carbonate to calcium carbonate precipitation. Add more CO2 and you get more calcium carbonate precipitation. The protons (H+) given off by the carbonic acid cannot affect the equilibrium. Only an outside source of protons can affect this equilibrium. Add to this the fact that they cannot show the serious acidification they claim, as sea water is a complex buffer, and that the weak carbonic acid cannot alter this much at all. They only assume acidification as distilled water would have a decreased pH with CO2 dissolved in it. Ocean pH has not moved outside the normal fluctuation range, so where do they get the low pH levels? The fact is also that photosynthesis is an alkalizing process and pH can rise to 10.5 in bays and estuaries on a sunny day. It is the high pH that is most threatening. A 10th or so less acidity is not going to change their day. What is really sad is that we have so many marine biologists who know so little about the ocean, or do not want to know about it, to keep up their funding. Thus, they can keep making really stupid statements about CO2 and acidification. As CO2 has been much higher than now for the vast majority of the last 600 million years, why on Earth would anybody begin to think a little added CO2 to an already very low CO2 concentration would be a bad thing? The Cliffs of Dover were not laid down during low CO2 periods, that’s for sure. I have found a direct correlation to ‘time spent on the toilet’ and the entertainment value on WUWT threads…but that is purely anecdotal and I doubt there is any correlation…but that never stopped Mann did it? What’s that I hear? It must be Nature calling! Max, isn’t that only if the water is CO2 saturated? There are approximately 37,400 billion tonnes of CO2 dissolved in the oceans. If 50% of man’s 30 billion tonnes of annual CO2 production is dissolved in the oceans, then over a 100 year period this will add 4.0% to the oceans’ carbon dioxide content – obviously, this is runaway acidification before our very eyes!!! Put another way, the oceans contain around 1.34 billion cubic kilometres of sea water, or 1.34 billion billion tonnes. At current levels, around 1,500 billion tonnes of CO2 will be absorbed by the oceans each 100 years – that’s one part CO2 per 89,330 parts ocean per century! The subject of ocean acidification from CO2 is complete BS and a typical unfounded alarmist story; where it happens it is very localised and the local fauna easily adapts, As usual, it’s all about the grants and not about the science when it comes to the purveyors of ‘climate science’. Perhaps because that same process also increases the concentration of bicarbonate ion, which more than likely is just as readily used by marine organisms. When CO2 is added to seawater, the total amount of bicarbonate plus carbonate increases, not decreases. In fact, how does one prepare a solution of Ca(HCO3)2 in the lab since solid Ca(HCO3)2 is not stable? CaCO3 has very low solubility in water. SImple, you bubble CO2 into a solution of pulverized calcium carbonate. In a few minutes the CaCO3 is completed dissolved yielding a clear Ca(HCO3)2 (aq) solution with a pH of 8.2 (if you add just enough CO2 to completely dissolve all the CaCO3). Sorry for the incorrect ” H2CO3 + CaCO3 2HCO3- + Ca2+(aq)” equation. I had some special characters in there that were interpreted as tags and got left out…. hopefully H2CO3 + CaCO3 ———> 2HCO3- + Ca2+(aq) pH = 8.2 comes out a little better. No it’s true. It’s elementary chemistry, and the world’s marine scientists haven’t been getting it wrong for years. More CO2, then less CO3–. This is the old school experiment. Blow into limewater. First it goes milky as CaCO3 is formed. Then (when OH- is gone) the CaCO3 dissolves (video). If you look at CO2 levels for the past 500 million years or so, you will find that we are curently contending with historically low levels of CO2. I have a fossil collection that contains many samples from geologically different time periods which to me indicates that an increase in CO2 levels presents no problem to the survival of coral. Possibly the opposite. No doubt the scare will now be related to the “unprecedented” rate of change which coral cant keep pace with in this goal post shifting climate “science”. 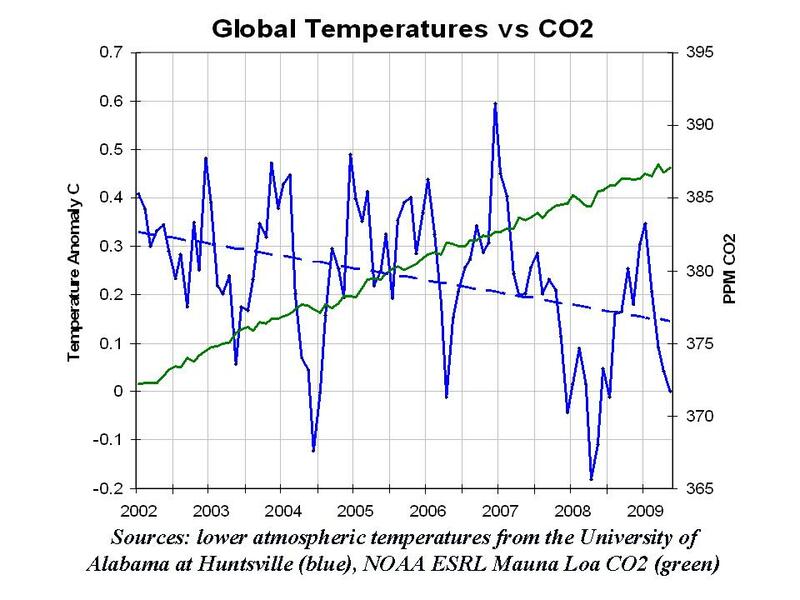 As I have said before, the CO2 increase in the atmosphere has ONLY BENEFICIAL EFFECTS. The CO2 from buried coal deposits is MEANT to be in the atmosphere. Also since [HCO3]/[CO3]=[H]/Ka2 ; at a constant pH, if [HCO3} increases due to added CO2, then [CO3] also must increase. Since there is way more CaCO3 in the ocean (in excess of 10000 gigatons) than we could ever add CO2 from burning fossil fuels, the net effect of adding CO2 to the ocean is to increase [CO3] once equilibration occurs. Based on the CO2 vents discussed in the article, it would seem equilibration occurs fairly rapidly or else the water would be considerably more acidic than it is. In my opinion this sums up the Australian Institute of Marine Science (AIMS), the Great barrier Reef Marine Park Authority (GBRMPA) and not to mention our mate Ove from the University of Queensland. Tasked with managing and understanding the ecosystem, these institutions have been used as a platform to attack farmers, fishermen and industry, no management, just vicious smears. Fortunately the reef has rarely complied with these doomsayers. The damage and very real danger to the reef will in my opinion result from the waste of human energy dealing with the legislation created by these latte sippers. Their ability to impoverish the productive people in the neighbouring communities has long been the real threat to marine ecosystems. Students of history know what happens when small minds start dressing up in uniforms, giving awards to each other and bossing people around, this is the modern Australia, a lost opportunity and AIMS is a monument to this failure! CO2 isn’t the problem. FRAUD is th problem! Et tu David? Did you not read Willis’ post that it should be ocean neutralization? What I don’t get is that anyone truly concerned about the welfare of coral reefs should be worried about the human related impacts which we know are damaging. Worrying about CO2 seems to draw attention away from actual threats, such as discharge of sewage or boat and ship anchors, or any of the other identified threats to healthy reefs. Why I can’t help believing it is more about money and not science or a true interest in stewardship. It seems that some species are able to cope with the dropping of CO3(2-) concentrations or use HCO3(-) directly when building their shells. It’s a good thing that not all species will be negatively affected when the concentration of CO2 in the air will continue to rise, but it seems to me that, after reading the paper of Ries, a lot of them will. Using the pK’s in this eoearth article one could calculate the concentration ratios of the carbonate species at different pH’s. More CO2 will lead to a drop in the CO3(2-) concentration and a higher H3O(+) and HCO3(-) concentration. The total amount of dissolved inorganic carbonate will rise, but less CO3(2-) influences the solubility of calcium carbonate (CaCO3), so it will be harder for a lot of species to maintain their calcium carbonate skeleton. You move from saturated, to super saturated…..and may be? I thought everyone knew they needed bicarbonates to work? Did you not read Willis’ post that it should be ocean neutralization? I might add that many of the coastlines in the coral zone are limestones that originated as coral that was exposed when sea level dropped and the beach sands are calcium carbonate grains of coral hard parts and shell fragments. Rising sea-level in recent times has increased the available limestone – organic and inorganic types- to buffer any acidification of the sea. So should we be crying about rising sea-level? Professor Ove is second only to Tim Flannery when it comes to sounding the ‘general alarm’ klaxon in Australia. He is an activist masquerading as a researcher, and is knee-deep in anything that will raise his own profile and send some funds his way. Time and time again I’ve had to explain to people that the Great Barrier Reef is still there. All the news that ever escapes about it is that it’s all doomed. Each decade brings a new scare. When I was a kid it was the crown of thorns starfish. Then it was agricultural run off. Now it is climate change. I can remember being seriously concerned that it would all be dead by the time I could see it. These scare stories have a very real impact on tourist revenue. The fricken’ thing is 1400 miles long. Most of it sees very little human impact. It’s not going anywhere in a hurry. Just once, I’d like to see a news report that said ‘Reef health excellent, come and take a look’. pH of the ocean is the result of a large multicomponent chemical equilibrium in which the limestone-carbonate-bicarbonate couple plays a huge role, not to mention other inorganic buffering systems. Realize also that the ocean contains vast amounts of weak organic acids and bases that also contribute to the system. And don’t forget photosynthesis that removes both CO2 and H+ from the water; increases in both of these two species will encourage aquatic plant growth, which is why there is such lush growth around CO2 vents. But since log 2 = 0.3, the alkalinity [“acidity!”] of sea water can physically nearly double or halve normally*. And we still haven’t “all died” yet! Isn’t part of the problem here the increasing specialisation of the work of the so-called ‘experts’? They study ever smaller areas of a subject so that they can become the ‘expert’ in that field but inevitably lose sight of the bigger picture. Not for nothing does conventional wisdom speak of not being able to see the wood for the trees. Nick Stokes maintains more CO2 will lead to a drop in the CO3(2-) concentration and a higher H3O(+) and HCO3(-) concentration. That is NOT true. In actuality, at equilibrium in the ocean more CO2 will lead to an increase both in the CO3(2-) and HCO3(-) concentrations and a relatively unchanged H3O(+) concentration. If you now add another 0.5 mole of CO2 to this very same solution, you will end up with a solution that contains slightly less than 1.0 mole of HCO3(-) and ~2x as much CO3(2-) as you had before, with the pH still being ~8.2. There is way more CaCO3 (limestone) in the ocean than we could ever add as CO2 from fossil fuels. CO2 is the limiting reagent, not CaCO3. Because the alarmistsa’s will never back down in the face of proof that shows them to be completely wrong, there will i feel come a time when they will turn their backs on the relatively peaceful ( thats sarcasm btw) lobbying they currently engage in. We already know the dire state of reference checking thats going on in the media and especially with the ipcc, they simply want it to be true so they dont bother to do the legwork to verify anything theyre spoonfed, so it could quite easily be that areas are destroyed by these “earth children” in the pursuit of , yes, promoting the idea of agw. After all, theyre quite happy to game data and reports and causes and smear opposing views and dissent to support the plot so why not attack the environment to further shore up their “evidence”? As you can see, my trust is at an all time low in regard to anything that comes from the other side of the fence. However, the crustaceans mentioned don’t form their shells from calcium carbonate but chitin which is a totally different material, basically a sugar polymer, so no surprise that they aren’t negatively impacted by a change in pH. Try blowing into sea-water – or watch the bubbles from scuba divers – any film will do. How can you tell if fish or coral are happy? It is beyond me. I would exempt true scientists from your list, but as for the rest it’s an impossible task. That leaves you two options. Ignore the lot, or bulldoze them all. Blogger Tim Blair once characterised what Prof Ove and his gang do as “green collar crime”. Seems fitting to me. I think this sort of phrasing encapsulates the “begging the question” sort of misleading contortions found throughout climate science. Personally, my body grows bones. I don’t know how my body decides their shapes and lengths, wall thickness and joint spacing, but I know that if I do workouts at the gym, my bones grow larger and stronger. If I laze about doing little, they grow thin and lighter. I don’t know how it all works, and I doubt these crabs and shell fish think too much about it either. These are misleading questions which form a conclusion, which is unrealistic. If a solution has a pH of around 8.0 (basic) and you add an acid to it, wouldn’t that tend to neutralise rather than acidify it? Why, they smile, of course. Thank you Bob Halstead for presenting the most explicit possible example of…what do we call this? — where none of the lines above the bottom line point to its orthodox conclusion. I have seen examples of this in late medieval theology and early scientific speculation under a church hegemony, but none were the non sequitur is so explicit. That a scientific institution of such standing could permit such a release, and that the release could occur without scandal, is an indicator of the acceptability within the scientific community of a level of corruption for which one struggles to find precedent. Unfortunately the concentrations you refer to have no relevance to the ocean chemistry! Increase the pCO2 by a few orders of magnitude and the [CO32−] will increase to 5.61 × 10−11 but [CO2] and [HCO3−] will increase by orders of magnitude! [Ca2+] in seawater is about 0.01 mol/kg. I laugh every time I hear some pronouncement like this. I’ve spent a great deal of my life in ‘natural’ environments, and I can verify that ‘Nature’ is not warm and cuddly. Nature is a continuous cycle of life and death. Eat and (not ‘or’) be eaten. Next time you run across some starry eyed ecoloon, explain that to them. Tell them the next time they bump into a major predator – lion, grizzly, gator, etc. – to not run. They will just die tired. Living in Townsville, Queensland I must then be living next to the largest dead organism on the planet then as AIMS/Greens and PEW seems convinced that anything from Crown of Thorns Starfish (1970’s), Silting (1980’s), Fertilizer runoff (1990’s), Coral Bleaching (1990’s), Global Warming(Current), Ocean Acidification, Coral Bleaching (2000’s), over fishing, ship groundings (20009), recreational fishing, commercial fishing (20005) etc must surely have managed to completely destroy the reef sometime last week. I wonder if anyone has told the tourist industry yet? Is it just me or is there a 10 year disaster cycle for funding required by AIMS to continue it’s um investigations? Yes, even when almost all threats have been conquered, we are still hard-wired to mitigate threats. When small minds, ego, and profit motive are combined; I imagine the only threat remaining is the loss of ones status. …..you get my drift…just be sure to add some wort of phrase about the inevaitable doom if we dont reduce/change our whatever. Actually the CO3(2-) concentration decreases when the CO2 concentration goes up. You can calculate it yourself using the pK’s in the eoearth link I gave in my reaction at 12:40 pm. Not only bubbles of natural co2 but also natural oil seeps. See the Gulf of Mexico or off the Californian coast which both release vast amounts of oil into the sea each year. (Shhhhhhh! apparently some microbes like chomping it). When is this scam going to end? By the process of photosynthesis, carbon dioxide reacts with water and sunlight to form carbonic acid and oxygen. Carbon dioxide also dissolves in the waters of the oceans, lakes and rivers up to a point where it is in equilibrium with that in the atmosphere. Some of the carbon dioxide in the water then converts to carbonic acid which is instrumental in weathering processes in rocks etc. This weathering yields bicarbonate ions (and other ions) and these end up in limestone beds on the ocean floor. Now the process of weathering is enhanced by warmer temperatures and the additional acidity due to greater photosynthesis. But, by LeChatelier’s Principle, equilibrium will be maintained by more carbon dioxide being dissolved out of the atmosphere to provide more carbonic acid. Your article is brilliantly written. I plan on stealing as much as I can. Your observations on CO2 vents makes me wonder how many there are and their relationship to existing CO2 observatories. Has this been covered before? The problem is that these scientists don’t read biochemistry papers. In reality, carbonate deposition is an active cell chemistry process controlled by enzymes, The carbonate is laid down in a complex protein matrix. pH and ocean chemistry has little effect. There are freshwater mussels that build their shells in highly acidic peat water. Living cells have long been able to isolate themselves from a changing environment. Good point -few here have highlighted the role of proteins especially in things like nacre. And yet life thrives around black smokers with ph less than 3. Likely the place were life started. The pH of the oceans has changed over several decades from 8.2 to 8.1–below the error range. Neither pH has ever been acidic. As a chemist I find that claim frankly infuriating. 8.2 and 8.1 are mild BASIC pH’s. As a physiologist, I am even more outraged by the dishonesty of the “ocean acidification” claims. The pH of blood is 7.4, in the neutral range, slightly basic. It is believed that this indicates that multicellular life arose under conditions around that pH or more neutral than today. While we aren’t talking about huge changes in any case, the best evidence we have is that partially neutralizing the world’s basic oceans should be beneficial to most marine life, yielding an increase in the total tonnage of organisms. All living things on Earth are carbon-based (ask any “organic chemist”) and all rely on reduction of CO2 for starting the formation of their tissues. Therefore, those who complain about CO2 at anything remotely close to current atmospheric levels, or up to five times those levels, are enemies of all Earthly living things. Phil, as with most warmists, you ignore the real system and present an strawman argument. The real system has 10000+ gigatons of undissolved CaCO3 available.This is not listed in your water composition. Try your experiment again using pCO2 3.5 × 10−4 (atm) over a beaker of water containing pulverized, undissolved CaCO3 and then tell me what the composition is. This is more more representative of the ocean and why the pH tends to be 8.2 and not the 5.65 you show above. In case you are a little slow with the calcs, I can tell you what the pH will be. It will be ~8.2 until all of the CaCO3 is dissolved. Problem for the warmists is, in the real ocean, you will run out of CO2 before you run out of undissolved CaCO3. It isn’t the equilibrium pH of the ocean that is really of concern as warmists mistakenly/misleadingly try to convince people of, it is only a possible problem of kinetics… how fast the CO2 gets neutralized by the available undissolved CaCO3. As a few people in this thread have already alluded to, even from the warmist side, is that in the presence of CO2(aq), solid CaCO3 dissolves rather quickly. So all of those published papers that focus on the supposed future pH of the ocean water and only talk about equilibrium concentrations as you have done above, and ignore the only real issue, the kinetics, their results are not worth much and their predictions quite likely to be wrong. Thanks Phil. Many people eat soft shell crabs or small shrimps, shell and all. Oyster shells, OTOH, tend to be left on the plate. How ignorant are these people not to know the difference? Failing that, why didn’t one of them with the brains of a mollusc ask themselves why the shells of crabs, shrimp and lobsters are either eaten or used in making stock, whereas clam shells are used as garden borders? Could it be that they are made of different substances? Coming soon – ocean acidification retards the growth of finger and toenails in surfers. “Because the alarmistsa’s will never back down in the face of proof that shows them to be completely wrong, there will i feel come a time when they will turn their backs on the relatively peaceful ( thats sarcasm btw) lobbying they currently engage in. Sadly, the greenies started damaging the environment they claim to want to protect here in southern Tasmania many years ago. We used to have a dolomite limestone quarry at Lune River a short distance from where I farm. Nearby the quarry is a cave system (water + dolomite = caves + pretty stalactites & stalagmites). The greenies decided that the pretty stalactites & stalagmites needed to be protected by closing down the quarry. Apparently, blasting in the quarry could cause stalagmites to fall from the cave roof and die an agonising death, impaled on the stalagmites beneath. When the authorities failed to act, the greenies acted, by smashing up parts of the cave system. In a week when there was no blasting. The quarry was closed and we now have to import dolomite from outside the district. Bob Brown suggested we should be purchasing it from Japan! The whole acidification scare is junk science. Hard clams and corals definitely do use calcium carbonate for their shells. Furthermore, the primary constituents of the polysaccharides that make up chitin include lots of carbon and oxygen, as is the case for all sugars. It’s possible the scientists expected some other interaction between the shells of the arthropods and less alkaline seawater with higher CO2 levels. CO2 that occurs in Nature is “good CO2”, but CO2 that man creates is “bad CO2”. Just ask the IPCC. I’d like to see more about the liquid CO2 seen oozing from deep-sea vents. CO2 is liquid under those pressures, (just as it is liquid within a fire extinguisher.) I don’t recall reading anything about the deep-sea clams in the area lacking shells. I assumed I wouldn’t see any further study, because it doesn’t advance the “cause” to have liquid CO2 trickling by a deep sea clam. In fact funding might even be cut off. I thought that the whole idea was that rising temperatures would drive CO2 OUT of the oceans as warmer water hold LESS CO2. That gives the dreded positive feedback which rises temperatures further and drives even more CO2 out of the oceans and so ensures that we are all certained DOOMED if we don’t renounce our wicked ways and ……. so forth and so on. OR have I got it all back the front? Rising CO2 levels in the atmosphere perhaps drives CO2 into of the oceans which causes the oceans to turn acidic, just like my insides, which kills off all sea life, which rot and give off a lot of methane which turns to CO2 in the presence of oxygen, which rises atmospheric CO2 which has come from the ocean, which lowers PH levels just in time which ……. CO2(aq) + CaCO3(s) ——> Ca(+2) + 2HCO3(-). CO2(aq) + CO3(2-) ———> 2HCO3(-). Unless the ocean has been depleted it’s huge reservoir of undissolved CaCO3, performing the calculations ignoring the buffering component (the undissolved CaCO3) is of little value. I’m very concerned about the effects of ocean acidification on sea cucumbers. Full immersion in an already briny solution driven to an acidic pH could put those poor sea cucumbers in a real pickle! And that wouldn’t be Kosher… or Would It??!! Oh dear…oh deary deary me….another greenie myth/lie goes spiralling down in flames! How many other CO2 vents are there hidden around the ocean floors? Do we know where they all are? Do we know how much CO2 is contributed to the atmosphere from these vents collectively? There would be a lot of vents – all along the ocean ridges. It is safe to assume though that the system is in equilibrium. Unless the ocean has been depleted it’s huge reservoir of undissolved CaCO3, performing the calculations ignoring the buffering component (the undissolved CaCO3) is of little value. Agreed. Climate scientists need a basic education in inorganic chemistry. You cannot acidify a buffer until you deplete the buffer. Give me a call when you’ve managed to remove the dissolved salts from the ocean. Until that happens you will not turn the oceans acidic. The amount of CO2 required is many times in excess of all known and projected fossil fuel reserves. On the order of a million years of industrial growth. It’s possible the scientists expected some other interaction between the shells of the arthropods and less alkaline seawater with higher CO2 levels. When you dissolve a shell in acid, that is inorganic chemistry. When life forms a shell in an acid environment, that is called a competitive advantage. Over time, evolution tells us that life with a competitive advantage will replace life that has no such advantage. With a billion+ years of evolution it should not be a surprise if life is able to turn lemons into lemonade. The life forms that could not are long since extinct. Though I support smart subsidies all the time, I don’t see the rationale behind the corn subsidy. It seems to be an outdated relic from when the agricultural vote was a necessity. Maybe the federal government should stop spending $25 billion on subsidizing corn and spend more on disease research, education, or frankly anything that has a greater value to the public good. What pure trash from the usual suspects and why you wouldn’t believe anything served up here. What a balls up ! The mention that sediment flowing onto the Great Barrier Reef from the rural industries is 5-10x pre-European, significant quantities of fertilzer nitrogen, phosphorus and phytosystem II herbicides doesn’t get a mention. The issue is cumulative stressors.. I think a full retraction is in order. Absolutely not. That reaction is the whole problem. The dissolution of CaCO3. Fine if it’s mineral limestone. But if it’s from sea critters? What I think you’re missing is the effect of the solubility product of CaCO3. If you convert carb to bicarb and Ca++ stays the same, CaCO3 will dissolve. There is a reserve of supersaturated aragonite, but that is limited. I’m sure climate scientists know more inorganic chemistry than you do. But you need an education on what climate scientists do. These are marine scientists. And adding any acid (with pKa exceeding the buffer pKa) depletes the buffer – moves the equilibrium in the acid direction. That’s how buffers work. In this case the overall effect, after intermediate reactions, is that almost every added molecule of CO2 dissolves a molecule of CaCO3. As I said above, there is a temporary delay due to a reserve of supersaturated aragonite. Presumably ‘Climate sceptic outing commission’ is an AIMS employee and/or a beneficiary of generous grants. 1. 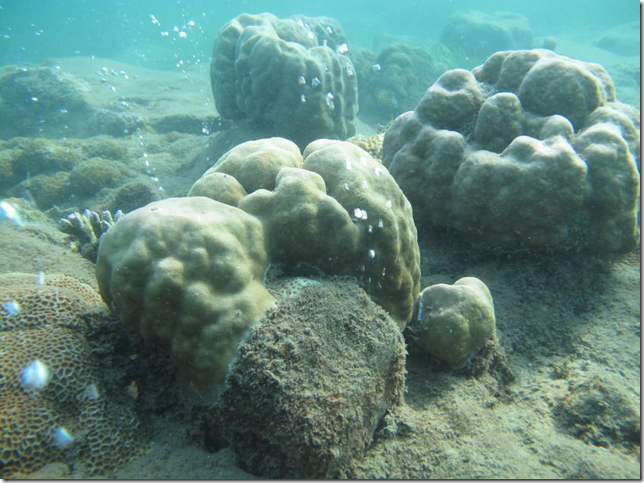 The sites investigated are ‘cool’ – um…..corals don’t grow all that well in cool water. 2. The sites investigated are ‘volcanic’ – um…….that means the presence of metal sulphides and nasty elements such as antimony, arsenic, cadmium, lead and mercury, which are deleterious to many life forms. 3. ‘Model predictions’ – as usual, GIGO and pre-determined conclusions. 4. ‘Acidification’ – this assumes ocean acidification will happen on a significant scale in the future, which it definitely will not unless man dramatically increases sulphate and nitrate emissions. 5. ‘Probably….within this century’ – typical alarmist statement, which translated means “won’t happen in my lifetime, so it doesn’t matter what I say”. In other words, this is another instance of: “it is the grants which matter, not the science”. 6. Geological record clearly shows coral reefs will adapt rapidly to climate change, as can be seen over the past 250 million years, or most recently over the past 12-15,000 years (since the end of the last Ice Age), when there was a dramatic increase (~8 degrees C) in average global temperature – see below. Is that a new name for Lazyteenager? 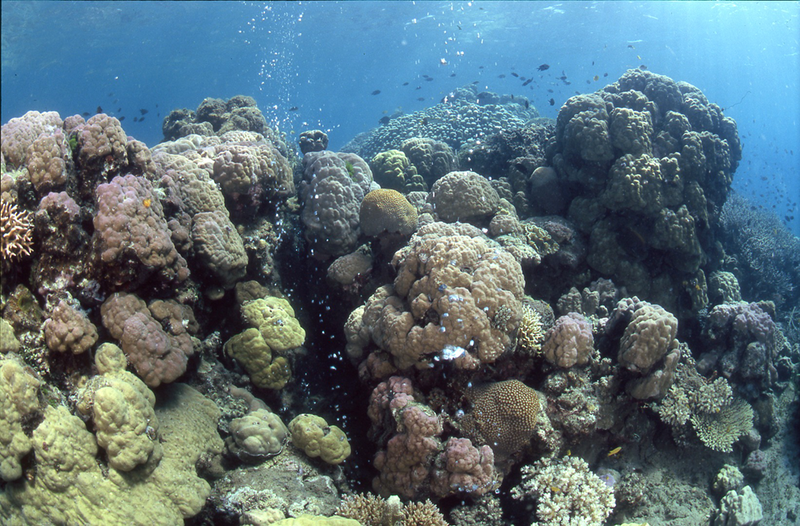 Corals need CO2 for growth and as food for its algal symbiots that provide the polyps with food. Seagrass photosynthesizes so needs CO2. Looking at all the very simple basic science here, references, links and pertinent anecdotes can I suggest that Dave and Willis write this up, publish it and put an end to ocean acidification for good…Using hydrochloric acid to acidify sea water, then saying look, they dont like it is just another example of the Al Gore and his co2 bottles. Fatally flawed. The eoearth website with the “dandy” calculations is referring to surface seawater. In surface seawater dissolution of CaCO3 will not occur ( omega > 1, http://en.wikipedia.org/wiki/Ocean_acidification#Calcification ), so they are correct to keep the Total Alkalinity constant. is not happening in sea surface waters because of the omega > 1. It occurs at greater depths where the solubility of CaCO3 (different for calcite and aragonite) is higher and therefore omega lower. Adding CO2 to the atmosphere causes the ocean depth at which calcium carbonate shells dissolve to become shallower. I think Nick Stokes is quite right in December 29, 2011 at 1:06 am, stating that this overall reaction is the main problem for sea critters. Anyone who thinks that the puny amount of CO2 we are putting into the air has to explain why life flourished so bountiful when CO2 was TWENTY TIMES today during periods in the recent geological past (200-400myo). Limestone deposits from that era dominates the continents when we had shallow seas. Limestone deposited from biological sources. I’m wondering why marine scientists received next to no funding over the last 50 years while MSX and Dermo decimated shellfish stocks on the East Coast pushing populations to perhaps 1 or 2% of their historic population but now that shellfish can be blamed on fossil fuels- the potential threat to them from CO2 is seen as a crisis and funding is pouring in? Of the top 25 threats to the ocean’s marine life where would you rank the CO2 “threat’? As you state there were a lot of shallow seas in that era and in shallow seas CaCO3 will not dissolve, so critters can maintain their calcium based skeleton (omega > 1). I wouldn’t bet on it. I have a PhD in physical chemistry. My postdoc advisor was (and is) a brilliant physicist… However his intuition about pure chemistry was a little lacking. In this case it means that adding CO2 to water will raise the concentration of bicarbonate ion, and that in turn will raise the amount of carbonate ion in the system. The effect on pH will be negligible because carbon dioxide in water is a weak acid, and bicarbonate is both a weak acid and a weak base. Together they create as a buffer system on the oceanic pH. Good point, jr. It seems obvious that if life found the environment around a smoker or other subsea volcanic vent unhospitable, they would not locate there. It’s just where a vent emerges and changes the prevailing environment that changes could occur until life adapts again. I did not want that situation misinterpreted by those with an agenda. Science is built on trust. The selection of environmental problems for funding and attention that always seem to fit regulatory self interest leads those of us who have labored for decades in this field to be highly skeptical. I would appreciate your thoughts as asked previously why shell fish are getting so much attention now from the acidification threat and yet for decades their decline as a result of disease and reef destruction were all but ignored. As an example in New Jersey the Dept. of Environ. Protection (DEP) ordered the planting of a disease resistant strain of oysters using private funds because it claimed it couldn’t monitor the possibility that some person might harvest them from unregulated waters. They never explained why they were not concerned with the clams and mussels already there. Then DEP turns around and says we need to be concerned about the proliferation in algae and therefore need to start controlling nitrogen sources – something the oysters do for free. And now we are told that we need to care about the plight of oysters because of acidification? After watching similar things happen again and again you just start to wonder whether this ever had anything to do with improving the quality of our natural resources. I think it’s important people remember that dissolved CO2 (bicarbonate) is a near neutral pH buffer. Can never make an acidic solution with CO2. In fact, we biologists use CO2 on purpose in incubators to act as a buffer and mitigate the acidifying effects cell cultures have on their medium (which will kill the cells if CO2 is not around to increase the pH and prevent it from acidifying). You are so wrong, it is painful reading your stuff. We use direct CO2 gas in culture incubators, where there is no CaCO3 or anything but normal cell media, to PREVENT the pH from becoming acidic. When CO2 dissolves into water, it soaks up hydrogen ions and forms carbonate/bicarbonate. The pH of that is around 6.90 or so. Thus, direct CO2 gas is used to keep cells alive and prevent them from turning their media acidic from cell waste products like lactic acid. The oceans are well buffered; a lot of acid or alkaloid must be introduced to change the pH of the oceans. That’s just wishful thinking though. The coral cover at the Great Barrier Reef (GBR) is steadily declining. Even Sweatmann (2011), who argues that the GBR is okay, shows that cover has declined in the last decade. Only thing is he blames crown-of-thorns starfish outbreaks and storm damage despite a lack of evidence for these. A major El Nino next year, should it occur, will be a real test for the GBR. It’s possible we’ll see an episode of mass coral bleaching, but let’s hope not eh? That’s another of those gross misunderstandings. Yes, the changes in the concentration of the various carbon species prevent the oceans from being more acidic, so it buffers acidity (an increase in hydronium ions in seawater) to a limited extent. But it does not prevent pH from declining – as is evidenced by pH time series from around the world. Obviously Rob Painting did not even read Dr Archibald’s article. Well, before those freshmen learnt about Le Chatelier, they should have learnt about mass conservation. Where’s the carbon coming from? And if you say, dissolving CaCO3 (sorta right), then ask Le C why that is happening when carbonate in solution is higher and Ca++ the same. I’d love to see a balanced equation for that. Ca(HCO3)2 is both soluble and *alkaline*. This is High School Chemistry. Remember the lime water test for CO2? Bubble CO2 into lime water and it goes cloudy (CaCO3). Carry on bubbling CO2 into the lime water and the precipitate disappears as Ca(HCO3)2 forms and goes into solution. The current rate of increase in atmospheric CO2 is perhaps unprecedented in at least 300 million years. The only global change occurring faster was the asteroid impact which wiped out the dinosaur. Puny is not a scientific term for it. That you perhaps touch upon inorganic sediments, highlights a rather obvious flaw in your argument. Whereas other commenters here seem to believe ancient coral were somehow invulnerable to ocean acidification and elevated temperatures, their existence during times of slowly changing periods of high atmospheric CO2, and the presence of inorganic carbonate sediments (which can only precipitate in strongly supersaturated seawater) illustrates that ancient seawater wasn’t actually harmful to marine life. Maybe the best example of this is the Cretaceous, so-named because of the massive coccolith deposits formed during period. The coccolith shells are made of calcium carbonate, or chalk, and Cretaceous means chalk. The White Cliffs of Dover, England are made from these coccolith deposits. If ancient seawater was corrosive, how did the coccolith populations explode to such an extent? And more importantly how did their skeletons manage to stay preserved in seawater that was corrosive to their shells? The answer lies in slow feedbacks, the silicate and carbonate weathering process, the calcite compensation depth, the ocean mixing rate, changes in biological cycling of ocean carbon. All of which slowly feed alkalinity back to the ocean, and can cope with slow change (weathering of rocks is veeeery slow) but not rapid. That’s why the ancient oceans acidified with abrupt increases in CO2, but were fine and dandy with slow change and very high CO2. It’s much more complicated that just the above though. I can point you to number of peer-reviewed scientific papers, if you like. Smokey – of course I read the article, it’s just wrong. Sure it’s maybe just me, but I like to actually read what the peer-reviewed science says on a topic. I have the impression that many here are not interested in such papers, but I am. Could you be so kind point me to some of them? Thanks in advance. Climate models predict levels of 600 ppm in 100 years, and 900 ppm in 200 years. No they don’t. These are assumptions/projections fed into the climate models. That a professional scientists would make this basic error brings into question the rest of what he says. See, empirical observations trump all peer reviewed papers. “Ocena acidification” is simply the latest climate alarmist scare. And like every other “carbon” scare, testable, empirical observations show that nothing unusual is occurring. Natural variability provides a full and complete explanation for all observations. Full copies are freely available on the web. Global warming hysteria summarized: Looking at a sewing push pin and claiming it to be a warrior’s spear. Smokey – I read the Fabricius (2011) paper some time ago, and wrote a blog post about it months ago. I’m well aware of the papers findings – coral cover declines with decreasing pH. Who knew? Yes, there are still unresolved issues, for instance, is the mean pH at the CO2 seeps the determinant of coral growth and cover, or is it brief exposure to extremely low pH? We don’t know yet, so the observations of Fabricius may overestimate the impact of lowered pH. I get the distinct impression from your posts that you don’t really understand a lot of this, otherwise you would not be making the erroneous comments you do. And again, no point in referring to Willis’ post, he’s no more an expert on ocean acidification than I am. Experts are those in a given field that publish in the peer-reviewed literature, and whose papers stand up to scrutiny by other experts. If you can point out contrarian peer-reviewed papers on OA I will certainly read them. Acidity is NOT NOT NOT a measure of hydronium ions to anyone but a layman where its usage is much too common. pH is not a measure of acidity to a chemist although Wikipedia trained chemists may think otherwise. Acidity is the capacity of a system to neutralize a base. It is solution pH – not acidity – that is the relationship of the hydronium ion relative to hydroxide. Acidity – as a further differentiation – is expressed in mg/l and pH in units. If you gave a lab a water sample and asked them to measure acidity – they would use pH (or a calorimetric indicator) as an end point in a titration using a standard alkali. More importantly any permittee submitting to EPA a pH reading as a substitute for acidity would be in violation of their permit. Your confusion about this important distinction explains your failure to understand buffering and why you can’t appreciate Willis’s insistence that neutralization was the proper term than ocean acidification. Painting could not be more wrong, and he displays his ignorance in promptly replying; because he could not possibly have read the linked articles and comments that I provided. Thus, his mind is made up and closed tight. That’s CaCO3 soaking up the protons. Let’s ee it just with CO2. You are really amusing Rob. 300 million years? Really? So CO2s higher now than the late Miocene or all of the Eocene? Or just about the entirety of the last 250 million years. This comment is just laughable. Pat I suggest you read what he said, then apologize. Care to point me to a peer-reviewed paper on ocean acidification by Willis then? Or shall I expect more bubkes? One can forgive your lack of knowledge on ocean chemistry, despite the fact you previously claimed some expertise, but really, a failure to understand a plainly written sentence does not bode well for your level of comprehension. Of course you could prove me wrong by linking to a scientific peer-reviewed paper which indicates otherwise. Personal incredulity and rhetoric only fools the sycophants. But I expect readers will understand a rate of increase in atmospheric CO2 is somewhat different to the absolute value. Could you please refrain from using Professor Ove Hoegh-Guldbergs name as I tend to bash my head against a brick wall whenever I hear it. The number of times this lunatic has predicted the demise of the Great Barrier Reef is beyond counting, and still he is regarded as an expert. As Rob Painting makes clear, he has no understanding of the scientific method. It is not the responsibility of scientific skeptics [the only honest kind of scientist] to prove a negative. The onus is entirely upon the alarmist cult to provide testable, reproducible, empirical evidence showing that human emissions are changing the oceans’ pH. They have failed miserably, primarily because the error bars for measuring pH are much wider than the claimed rate of change. So they post worthless pal reviewed papers that are good for grant trolling, but not much else. Anyone who relies on pal review papers over contrary empirical observation is a credulous fool. For further enlightenment, order A.W. Montford’s The Hockey Stick Illusion, available on the right sidebar. And of course, read the free Climategate 1 & 2 email dumps to see just how corrupt the peer review system has become. If it were not for the endless Appeal to Pal Review Authority, the alarmist contingent would have nothing but psychological projection to fall back on. You are unbelievable- are you seriously claiming an ability to differentiate the rate of change in CO2 on a decade or even century time scale going back 300 million years? The chuckles keep coming. You keep alleging I’ve misrepresented my CV – not a good idea. No not in freshwater, add more CO2 and bicarbonate (the dominant ion) will increase but carbonate won’t. That’s rich coming from the poster of a strawman example of freshwater solution (not ocean) in which 100,000 times more CO2 is added than the present equilibrium composition and 100x more calcium ions added. So you ignored the real system and posted your strawman instead, then anyone who points out the flaws in your argument is ignoring the real system! Of course if you were right the aragonite shells would dissolve anyway, oops! Far from soaking up it actually creates hydrogen ions! Rob is blowing more smoke than a deep sea vent! While the relatively mild volcanic activity we currently experience is not a major CO2 atmospheric contributor I would be hard pressed to believe as an example the rate of change wasn’t higher when Pangea broke apart forming the Central Atlantic Magmatic Province. Or given the fact that the Eocene saw CO2 perhaps 3-5X higher than today that at no time was the rate greater. And for someone to claim with great bluster that we can see time scales in the geologic record at the 100 year level is just well- you know. FYI: The photos in the link below show what happens to a pteropod’s shell when placed in sea water with pH 7.84. The shell slowly dissolves after 45 days. Gee Phil, I guess they do dissolve, imagine that. even at pH’s found at various times of the day and locations throughout today’s oceans. One of the main reasons live critters shells are just fine is because they have a protective coating. Agreed, fundamental chemistry requirement to characterize the gases. Maybe someone can teach an old dog something here. Do these chitin-covered creatures create their chitin shell from the carbon in the water or from the food that they eat? I do know that salmon meat is colored based upon the food source. For those salmon that eat more squid (less chitin), their meat is less pink and most often a marbled quality. Do land arthropods’ carapace determined by atmospheric carbon or by the food that they eat? Or am I confusing things here? “Gee Phil, I guess they do dissolve, imagine that. even at pH’s found at various times of the day and locations throughout today’s oceans. Not just protective coating– there is a complex mixture of proteins and polysaccharides that actually promote aragonite formation in mollusks. Shell making is not a simple physical chemistry – it is more properly bio-mineralization that we are not even close to understanding yet. The bio-minerals of the shell are quite different than inorganic crystals- to the point of contravening thermodynamic stability (some bizarre stuff here but beyond this post). Phil should explain why acidic proteins are involved in the living shell’s biomineraliztion of calcium. Things are never so simple as some would like to believe. And Phil’s link to dissolving shells? Well yes they’re dead. Most corpses “dissolve” once their dead. This is a chicken or the egg question because what they eat is in the water- calcium and carbon. And being filter feeders we could argue all day whether its from the water or their feeding. (A mature oyster may filter over 30 gal of water a day straining it or food) Molluscs secrete a complex set of proteins and polysaccharides that basically (trying to be simple) triggers the formation of calcium crystals (forming the cement of the shell). This most often happens depending on the life stage in a sealed enclosure in that flexible rubbery area at the edge of the shell. Shell growth comes from within the mollusk. Kiwi I thought described it nicely earlier saying the proteins formed the steel superstructure and the calcium carbonate was the poured cement. But you can look at as these proteins force the cement form. Looking at this I did a bad job of explaining – but best I can do without lots more detail. I’ve talked about oysters in this post- when you consider that they filter upwards of 30 gallons each you can begin to appreciate what billions of them once did to our estuaries. It is thought they once filtered the entire contents of Chesapeake Bay every 3 days – removing the algae as food in the process. As a result of disease and reef destruction it now takes more than a year for the few remaining oysters to do the same thing. EPA amazingly says the algae growth we see now is the result of too much nitrogen not too few oysters and NOAA doesn’t care about the disease and the reef loss that have crashed their population 99%- they’re concerned what ocean acidification might do to them in a hundred years. And we as taxpayer get to pay and pay- god forbid we should fix the problem because what would happen to EPA jobs. Aughhhhhh! but I was asking about the chitin-based carapace bearing creatures referenced in the article. Were they not suggesting that they analyzed the lobsters to determine the possible detrimental effect of higher CO2. 1) “Isn’t the lobster a chitin-bearing carapace creature who creates its shell from its food source? 2) What do they mean by “didn’t seem to care”? 3) How did they measure the “feelings” of the lobster and clams in a reef? 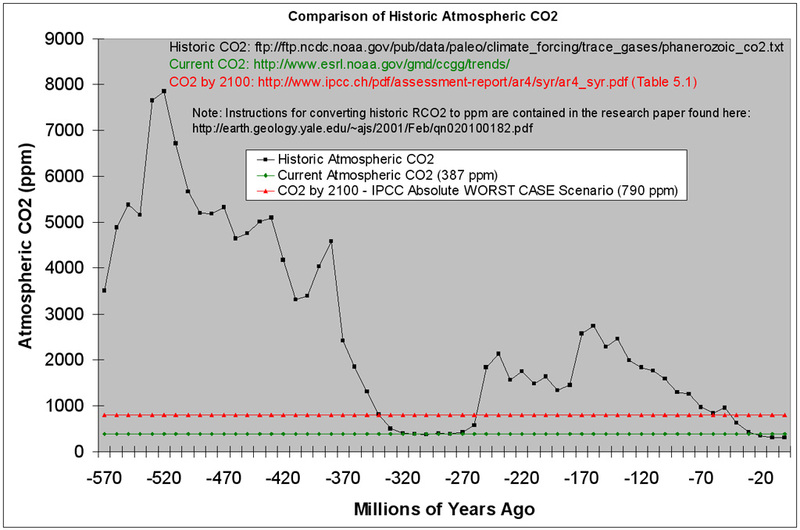 4) How did they conduct a study when the atmospheric CO2 was over 1,000ppm? 5) What, if any, were the impacts upon the ocean when the atmospheric CO2 was over 1,000ppm? Sounds like you are wanting to have it both ways. On the one hand, you appear to be claiming that more CO2 will loweri the pH which will result in dissolution of the shells of sea criters and the destruction of reefs and on the other hand dissolution of non-living sources of CaCO3 will not occur. Lets look at TA shall we? The addition (or removal) of CO2 to a solution does not change the alkalinity. This is because the net reaction produces the same number of equivalents of positively contributing species (H+) as negative contributing species (HCO3- and/or CO32-). Addition of CO2 to a solution in contact with solid carbonate minerals in groundwater or seawater The dissolution of carbonate rock has a strong influence on the alkalinity. This is because carbonate rock is composed of CaCO3 and its dissociation will add Ca+2 and CO3−2 into solution. Ca+2 will not influence alkalinity, but CO3−2 will increase alkalinity by 2 units. So it seems only by choosing to pretend that addition of CO2 has no effect on non-liviing sources of CaCO3 dissolution rates can make the claim that TA remains constant with addition of CO2. The really sad thing is that we KNOW what causes coral bleaching. And it isn’t CO2. A large number of things are known to do it (many of them real pollutants), but one of the most evil is that all those folks going to study that coral and CO2 “toxicity” are likely to be slathering on bottles of sunscreen while on the boat. That sunscreen is DEMONSTRATED to cause coral bleaching even at astoundingly low concentrations. Sunscreens cause the rapid and complete bleaching of hard corals, even at extremely low concentrations. The effect of sunscreens is due to organic ultraviolet filters, which are able to induce the lytic viral cycle in symbiotic zooxanthellae with latent infections. Pat Moffitt – “You keep alleging I’ve misrepresented my CV – not a good idea. Let me refresh your memory form the other WUWT thread. So you don’t understand Dalton’s Law of partial pressure, or Henry’s Law. The fundamentals are a mystery to you. So decades of peer-reviewed literature on these processes you have no idea about. Still not encouraging. Do think magic stops atmospheric CO2 from inexorably drifting up or down? That was your appeal to authority. You don’t understand the fundamentals and yet are quick to dismiss the work of actual experts – that which stands up to scrutiny in the peer-reviewed literature. Of course you could redeem yourself in the eyes of non-sychophantic readers and explain to everyone how the silicate and carbonate processes actually work, and why, using Dalton’s law of partial pressure and Henry’s Law, you don’t expect the oceans to be a carbon sink. Might bet is you’ll shuffle out some new diversion, to shift attention away from your lack of knowledge on these topics, but we’ll see….. Correct me if I am wrong, but I am under the impression that chitin is the stuff that makes up the ‘shells’ of crustaceans, the ‘tongues’ of molluscs and the beaks of cephalopods like squid. It is quite different from the stuff that makes up the shells of shellfish, being a flexible organic polymer. It is also common in land based creepy crawlies such as the skins of cicadas and the joints of caterpillars. Since crustaceans and squid are not filter feeders, I think you may have got your wires crossed, Pat. That’s why I found the whole exercise so laughable – a lobster’s chitin coat has nothing in common with an oyster shell except that they are both called ‘shells’ in common parlance. As I pointed out in my earlier post, there are sound reasons why one is eaten and the other is used for landscaping. Same with me too, but we should go easy on the poor kid. He’s only just discovered that the Big Leagues exist …. ….. and Lysenkoism ain’t what it used to be. Please read the wikipedia link. In sea surface water the omega is larger than 1 so no dissolution of CaCO3 will occur there and therefore the total alkalinity will remain constant. As a consequence of adding CO2 to the atmosphere the pH of sea surface water will drop, which is affirmed by measurements. See the link I gave you before. If I recall that was a site off Hawaii and the pH drop was 0.04units. Do you really trust data with a trend this small? And I can think of many other reasons besides CO2. Do researchers never look into aquarium equipment catalogs? Why does peer-review matter so much to you? Evaluate the science, not the approval of the bandwagon. Those predicting disaster are never for lack of an audience, nor does their credibility suffer nearly as much as it deserves. As a sycophant of cartoonist John Cook’s Pseudo-Skeptical Pseudo-Science blog, Rob Painting accuses others of his own logical fallacy of Appeal to Authority, which he himself continuously relies upon in place of the scientific method. In fact, Painting’s endlessly referenced “authority” consists of a small clique of gatekeepers that control the thoroughly corrupted climate pal review system. The documentation is found throughout the unrefuted Climategate emails, in which the Mann/Jones clique repeatedly conspires to threaten and replace journal reviewers and Boards. In many cases their threats were effective. The climate journal/pal review system has degraded into Lysenkoism. Painter’s increasingly desperate appeal to that corrupted ‘authority’ has nothing to do with science or the scientific method, and everything to do with the propaganda necessary to keep the grant gravy train on track. Notice that the climate alarmist crowd always trumpets issues which cannot be quantified, such as the unsupportable claim that the oceans are becoming “acidified”, or the sensitivity of global temperatures to ΔCO2. Whenever an issue arises that can be decisively quantified, the outcome always favors scientific skeptics. Therefore, propagandists like Painter limit themselves to trumpeting vague conjectures; opinions that cannot withstand the scientific method. That is not science, that is advocacy. As any visitor to this site knows, the organisms in the marine environment have evolved over a period of hundreds of millions of years, including major excursions in the earth’s environment, and major changes of CO2 level in the biosphere. Corals are a good case in point, They have evolved to survive, and we do not begin to know the limits of their adaptive possibilities. There seems to be a widespread (mis)understanding that simple inorganic chemistry applies to biological processes for deposition of calcareous skeletal material, It doesnt, because in the majority of cases the “skeleton” is actively deposited, or directed, in closed biological homeostatic systems, and closed compartments, not in the “open seawater”. Biological materials (e.g.proteins, mucopolysaccharides) are intimately associated with the deposited crystals, affecting their “solubility”. For a clear and readable explanation of the basic scientific principles, I refer the reader to Westbroek, P. 1991 Life as a Geological Force, Norton, N.Y. I do hope you keep posting because you do more to destroy the credibility of ocean acidification advocacy than anything I could hope to accomplish. Backing off you 300 million year CO2 claim? Answer this Rob are all the oceans at every location at all times a sink? Or is it more properly thought when we add up all the marine areas that are outgassing and the areas where they are acting as a sink we come up with a net sink value? You like to cite papers showing CO2 impact on shallow and near shore waters. Here I’m calling absolute BS. There is no clear evidence that shallow marine waters are in any way controlled by the small current changes in atmospheric CO2 nor can anyone measure a pH trend in the hundreths of a pH unit. Willis showed the picture of a coral reef outgassing CO2- so stuff that in your Henry’s Law pipe and smoke it. You clearly have no clue about near shore sediment exchanges (if you understood acidity you would pay far more attention to the sulfur cycles in these locales or even the N impact on alkalinity) Nor do you appreciate the influence of growndwater, terrestrial organic acids, primary productivity effects etc on coastal environments in near shore waters. So when you throw out “peer reviewed” papers you clearly do not understand using some ecosytem response in a near shore water- I just have to chuckle. You don’t understand the fundamentals and yet are quick to dismiss the work of actual experts – that which stands up to scrutiny in the peer-reviewed literature. Rob- expert has a legal definition- and according to the courts I am an expert witness. Are you? So you don’t understand Dalton’s Law of partial pressure, or Henry’s Law. The fundamentals area mystery to you. You caught me- I’ve been trying to hide the fact that I didn’t know basic chemistry for years from EPA while being the responsible signatory manager for my laboratory. You are really dense if you think you can bluff your way through this. Also served on Presidential Commission, Congressional testimony on coastal marine impacts, international boards etc before retiring in disgust over what has happened to environmental sciences. But the fact that a Police academy grad and others like you now speak for the “science”- is the reason I’ve decided to un-retire. I could Rob- but its clear you would not understand it. Oh- Rob –you really think you can debate eco-system silica dynamics? I always am looking for someone to discuss this with as it is one of my interests especially as its deficiency relates to the proliferation of nano-pico phytoplankton. You Say “You don’t understand the fundamentals and yet are quick to dismiss the work of actual experts – that which stands up to scrutiny in the peer-reviewed literature.”Rob- expert has a legal definition- and according to the courts I am an expert witness. Are you? You Say “So you don’t understand Dalton’s Law of partial pressure, or Henry’s Law. The fundamentals are a mystery to you.”You caught me- I’ve been trying to hide the fact that I didn’t know basic chemistry for years from EPA while being the responsible signatory manager for my laboratory. You are really dense if you think you can bluff your way through this. Also served on Presidential Commission, Congressional testimony on coastal marine impacts, international boards etc before retiring in disgust over what has happened to environmental sciences. But the fact that a Police academy grad and others like you now speak for the “science”- is the reason I’ve decided to un-retire. You Say- “Of course you could redeem yourself in the eyes of non-sychophantic readers and explain to everyone how the silicate and carbonate processes actually work, and why, using Dalton’s law of partial pressure and Henry’s Law, you don’t expect the oceans to be a carbon sink.”I could Rob- but its clear you would not understand it. Oh- Rob –you really think you can debate eco-system silica dynamics? I always am looking for someone to discuss this with as it is one of my interests especially as its deficiency relates to the proliferation of nano-pico phytoplankton. ” It doesnt, because in the majority of cases the “skeleton” is actively deposited, or directed, in closed biological homeostatic systems, and closed compartments, not in the “open seawater”. You are absolutely correct and causes me to bang my head when I hear people try to describe this process using simple physical chemistry and ignore the fact these creature are creating encapsulated “micro-environments” in which these processes unfold. Oh, just that little matter of actually being correct. Reality is the final arbiter of science don’t you know? Try taking medical care based on what non-experts think. Let me know how you get on. Pat Moffitt – posting paragraphs of “oh, it’s sooooo complicated, other people wouldn’t understand!” isn’t an answer. Your failure to answer even one simple question on ocean chemistry is duly noted. Given your previous efforts – to be expected I guess. You must have special eyes to recognize CO2. What was the pH and aragonite saturation state when that picture was taken? Mean value, and fluctuations? I told you I’ve written a blog post on the Fabricius (2011) study, their material indicates the pH of the waters are significantly diluted by mixing when the trade winds blow. Pictures of fish swimming over bubbles is not very informative. I don’t think anyone expects adult fish to dissolve. Dude are you serious? Convert that into a percentage. Tell me what you get. I agree with you Rob it would probably not go well. The real danger would be people with no medical training or experience believing because they had read a few papers in JAMA they were now sufficiently qualified to dispense medical advice to patients AND scold real physicians with whom they disagree. That would be the height of hubris- wouldn’t it Rob- most likely dangerous? What was your training and experience again? My New Years resolution is to joust less with mysids. I am owning up to nicking the excellent photograph for my blog http://phenell.wordpress.com/2012/01/01/the-coral-dollar/#more-148. Hopefully, you will not mind this too much. Earth to Painting: You are not the arbiter of what is ‘correct’. As a matter of fact, the CO2=CAGW conjecture has been debunked by no less an authority than Planet Earth itself. And since it turns out that ≈80% of all peer reviewed papers have serious errors [probably >90% in the climate field], the fact that a paper may have been peer reviewed means next to nothing. This is what actually matters. Coral, like ICe and Polar bears is something most people don’t see, or know that much about. Makes it easier to lie about ti. It is impossible to debate with most folk who press SS links upon one. They who swim in Kool-Aid will drown in their own effluent. but mostly it comes from fundamentally damaged individuals who suffer from combination cognitive dissonance and the evolutionary imperative (to acquire desirable mates), argumentative reasoning. They must win the discussion in order to prove themselves – long after their internal dialogue reveals errors in their thinking. To do otherwise shows weakness. Pat, we went over this before remember? I’m no expert on ocean acidification, Willis isn’t, and neither it seems are you. Experts are people who publish peer-reviewed papers and whose work survives scrutiny by other experts. Dude, that’s how science works. And why can’t you carry out a simple pH calculation? Exactly, I wouldn’t contradict what peer-reviewed scientists have to say on a topic, unless I could prove them wrong. You constantly contradict what actual experts have published on ocean acidification, and when I call you out, to demonstrate some of this so-called expertise, what happens? Bubkes. You can’t answer one simple question. All you do is offer pseudo-scientific bafflegab, as if that is supposed to impress anyone older than a college student. Oh, and it’s hundreds of papers on ocean acidification remember? I’ve read hundreds. Still doesn’t make me an expert though, just better informed than you. Heck, you don’t even seem to know about the pioneering work carried out by Roger Revelle.You remember?, where you didn’t even understand the oceans are a CO2 sink. Smokey – does taking a measurement 100mm from a CO2 bubble stream seem like a scientifically robust way to measure the mean state of the seawater in which coral grow? What about ocean mixing by waves and currents? Can you point out to me where multiple observations were taken over time to address this obvious flaw in the article above? You know, stuff that Fabricius (2011) accounted for.